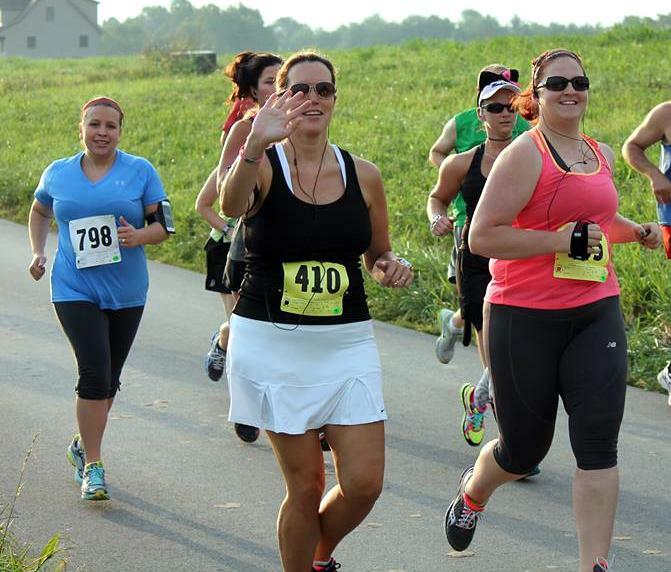 Yesterday I ran the Run for Pets 15k, in Burgin, KY with Julie, Amy, and a new friend, Karie! I had already decided I was going to run with Julie the whole time. I knew it was a very hilly course and we could be good support for each other. I'm SO glad I did! On my way to the race I heard the weather was supposed to be in the 90's, but with the humidity, it would feel like 100. I was not very excited about that! It turned out to be a cloudy morning, and I think the sun made an appearance only once for about a minute. There was a nice breeze, so it was actually very nice! This was one of those runs where I felt like I could run forever, it was that perfect! I was waving, not trying to block the paparazzi. Thanks Ruby, "The Picture Lady" for the pic! As you can see, this race was in a farm town. It was a beautiful course, along a rural road. Lots of cows and even some mini horses. There's nothing like running and getting a huge whiff of cow manure! I've got to say, the participants in this race were the friendliest people ever! The course was an out and back, and almost every single person who passed us on their way back were SO encouraging. There was a lot of "great job", "looking good", and so on. I've always thought the running community was the nicest group of people, but these people even went beyond that. It was awesome! The only bad thing about the race was they ran out of water!! On the way back there were a couple water stops with no water left. After the race, there was NO WATER. Thankfully, Amy, who had finished before us, had saved a bottle for us. But I know a lot of people behind us had none. Honestly, I don't think there's any excuse for a race running out of water. You know exactly how many people signed up, how hard is it to make sure you have enough water? It's better to get too much, then to not have enough! If you see you're running low, have someone go up to the store and buy more! I don't understand that. But other than that, it was a great race, and I'll definitely do it again! Afterwards we all celebrated by going out for Mexican. I LOVED running with these girls. They all did great. Karie has been following the Couch 2 5k program, and got a PR! Amy, (who has lost over 50 lbs.) was speedy, as usual. Julie and my goal was under 2 hours, not real sure of our final time, but I think it was right at 2:00. Can't wait to run with these ladies again! Now I'm going to enjoy the rest of this Holiday weekend! I got sick of my messy closet and got rid of 4 garbage bags full of clothes, purses, shoes, etc.! (I think my twinnie really loves me now because I gave it all to her!) I promise this 'before' pic is not a reflection on my superb housekeeping skillz! Have you ever ran a race that ran out of water? Am I the only one with a very messy closet? I have never heard of a race running out of water. Wow. That is pretty bad! Yikes, to run out of water in those extreme temps is not good! I'm glad you had a good race though! Your legs are super awesome by the way! I heard that at the Cooper River Bridge run in town they ran out of water and food for the people at the end. They blamed it on faster runners taking more than 1 water bottle. However if you run 6 miles and it is burning hot I could see some people drinking more than one bottle. I don't think that is a good excuse. That's crazy. I agree with you, there is no good excuse! I've done races where particular water stops ran out of water, but never the finish line. Absolutely unacceptable, especially on a super hot day. Great job on the race! It sure is. Thanks, Maureen! Ugh, yes!! The race I ran when they gave us the wrong directions ran out of water. The 5kers actually ran over 4 miles, and the 10kers ran over 8 miles! It was the worst race ever. That is ridiculous!!! Makes you wonder who put that race together! Thanks Tyly! I would start crying if there wasn't water waiting for me after a race! I've never run into that dilemma, and hope I never do! 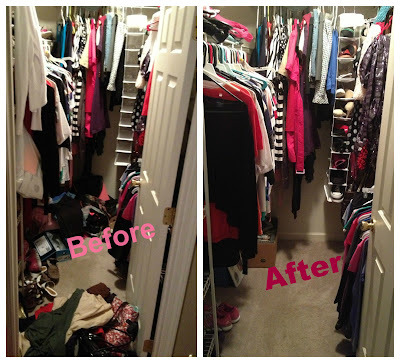 My closets are clean, but I've been out of hangers for quite some time. I finally picked some up, so I'll be able to hang everything and organize! I hope that never happens to you either. I was starting to get mad! You pay $25-$30 for these races and it's ridiculous to run out of water! Looks like a great race, minus the no water thing. Poor planning on their part. It was a great race, other than that! I ran a half marathon that at mile 8 they started to take down the course (there were a lot of people behind us), so for the last 5 miles there weren't even course markers. Or water. Dirty word. Congrats on a great race! I was actually shocked that some of the water stops at the RnR Half in Chicago I ran this summer had run out of water. There were actually some nice people that started running hoses to allow people to fill their water bottles, and cups (if you could find one), but then you had to stop, get in line, and get a turn with the hose. It was hot, but they knew it was going to be hot, so you would think they would have had plenty of water & cups. Fortunately, there was plenty at the finish line. Great job on that race girl! We need to catch up soon.. Call me? Well, it definitely sounds like you tried to have plenty for everyone, there must've been some extremely thirsty runners! Thank you for such a beautiful race, you guys did great. I look forward to running it next year!